Working for the United Nations Assistant Secretary General, meeting a prime minister and interviewing remote farmers were just some of the experiences international relations student Laurelle Neugebauer had when she undertook a six-month UN internship in Timor-Leste. Laurelle Neugebauer with former Prime Minister of Timor-Leste Rui Maria de Araújo (centre) and UN consultants and associates (photo credit: Laurelle Neugebauer). Neugebauer was one of three Curtin international relations students who were selected for the six-month opportunity from March to September last year. 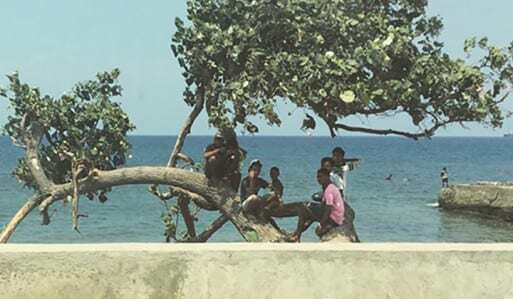 The student – now, graduate – worked as a program assistant for the UN Development Programme (UNDP) communications department in Dili, the country’s capital. While there, Neugebauer, 22, supported the UNDP Regional Office in Bangkok by preparing a confidential high-level briefing package for the UN Assistant Secretary General and UNDP Director of the Regional Bureau for Asia and the Pacific Haoliang Xu, as well as other official delegates. She also assisted in drafting Timor-Leste’s national roadmap policy for implementation of the UN’s 17 Sustainable Development Goals. Although she initially found the responsibility daunting, Neugebauer says the skills she learned during her degree helped prepare her for the challenges. “In preparing Mr Xu’s briefing package, I worked closely with [former Timor-Leste] UN Resident Coordinator Mr Knut Ostby, whereby I prepared briefing notes, talking points, in-country reports, UNDP project updates, logistical details and meeting schedules,” she says. 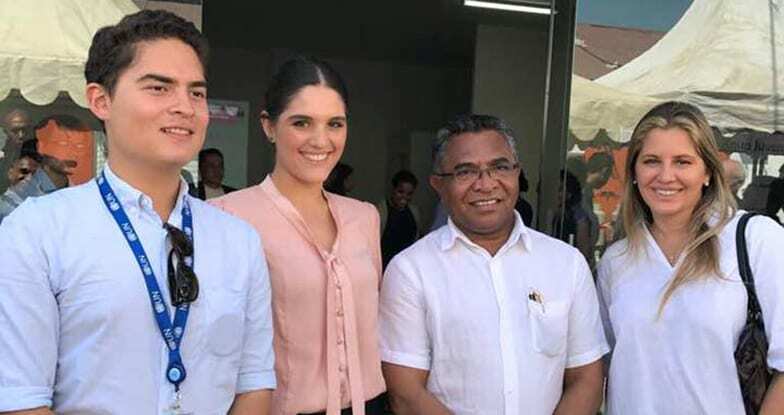 Neugebauer was then asked to support the launch of Knua Juventude Fila-Liman, a centre jointly orchestrated by the UNDP, Timor-Leste government and private parties to help young entrepreneurs develop viable business concepts. The country has one of the world’s youngest populations, with approximately 70 per cent of the population being under 30 years of age1. 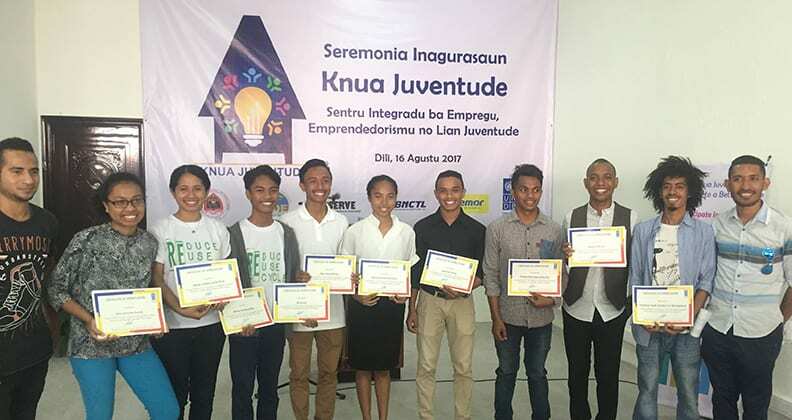 Timor-Leste youth awarded for their innovation at Knua Juventude Fila-Liman (photo credit: Laurelle Neugebauer). Neugebauer took part in a smorgasbord of activities, including assisting in the interior design of the physical centre, drafting manuals and long-term strategic documents, planning training schedules, event management and stakeholder engagement, and creating the Facebook page. She also made her own recommendations. “I suggested a ‘Youth Voices’ component to allow young Timorese to discuss social issues in a healthy and sustainable manner. I also worked with Timorese youth to develop a volunteer program where they do something good for their community, either by writing a story to highlight important social issues, picking up rubbish or advocating for change,” she says. While supporting the launch of the centre, Neugebauer was sponsored as a scholarship recipient of the Crawford Fund’s International Agricultural Student Awards to travel once a month to Oecusse, a remote coastal enclave of Timor-Leste surrounded by Indonesian governed West Timor, to conduct research on agribusiness and food security. The scholarship enabled Neugebauer to work with the Ministry of Agriculture and Fisheries to map the region’s most nutritional and highly profitable products into a value chain analysis and travel to isolated areas to conduct interviews with more than 90 subsistence farmers. “One of the most challenging experiences I had was travelling for five hours to interview subsistence farmers. During the interview the farmers told us that they did not have access to roads to sell their goods, or access to health services, because of their isolation. I felt fairly hopeless that I could not help their dire situation,” she says. Neugebauer with subsistence farmers and members of the Ministry for Agriculture and Fisheries in Oecusse (photo credit: Laurelle Neugebauer). The opportunity awarded to Neugebauer and her two peers – international relations undergraduate student Cecilia McIntosh and postgraduate student Kannika Bryson – came about after 13 intense months of negotiation between Curtin and the UN, according to Curtin lecturer and the UN program coordinator, Chris Ryan. 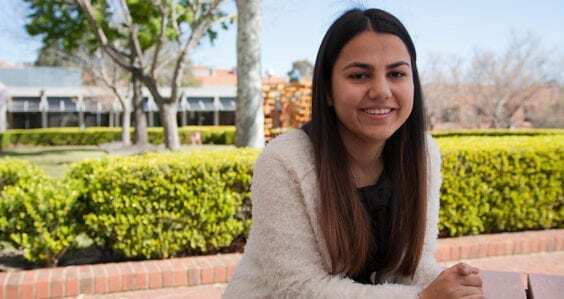 “In 2016, I was invited to a UN conference in Timor-Leste and began talking to the UNDP country director to see if they’d be interested in taking Curtin students as interns. We negotiated with the UN for 13 months before our students were on the ground,” Ryan says. Since returning to Perth, Neugebauer has secured a job as a management clerk at the US Consulate in Perth, assisting in the public diplomacy of US-Australian relations and its ‘fulcrum’ to the Indo-Pacific region. In the future, she hopes to draw upon her experiences to run her own non-government organisation that provides solutions to water-food-energy insecurity in developing nations. “Throughout my studies, I have become increasingly passionate about the water-food-energy nexus. The nexus highlights that water, food and energy are inextricably linked as all life forms depend on it,” says Neugebauer. “The scarcity or non-availability of these resources threatens the security of humanity, destabilising our relationships and exacerbating global issues. Three new international relations students are expected to begin internships with the UN in March this year. 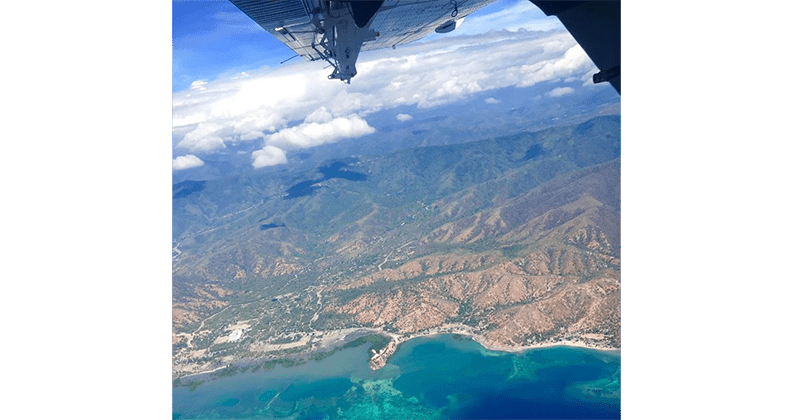 Flight from Dili to Oecusse (photo credit: Laurelle Neugebauer). 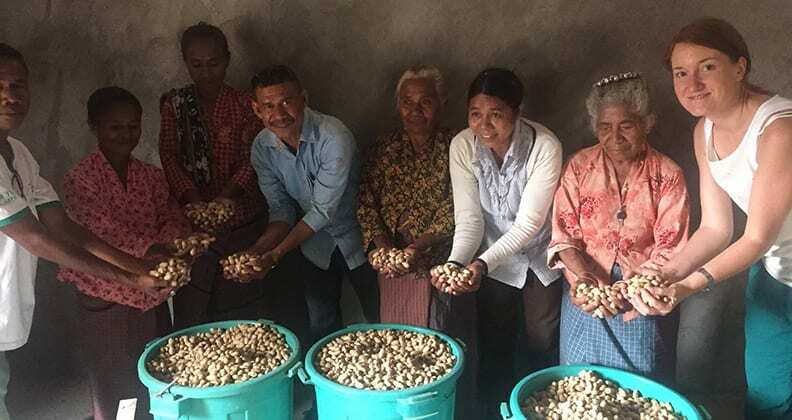 Assessing production of peanuts in Oecusse (photo credit: Laurelle Neugebauer). 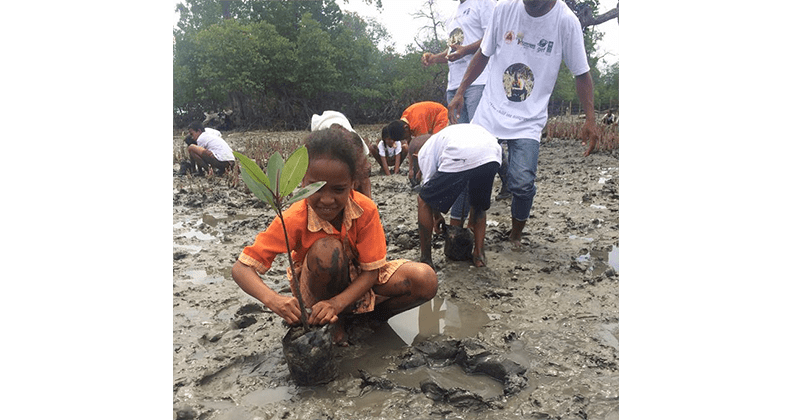 Planting mangroves with school children to protect coastal livelihoods from climate change (photo credit: Laurelle Neugebauer). This dynamic course focuses on current international topics and issues, covering the fields of political theory, international relations theory, foreign policy, strategic studies and political history. This course will provide you with the skills and knowledge to understand contemporary international relations, world trends, diplomacy, security challenges and strategic affairs from an interdisciplinary perspective.